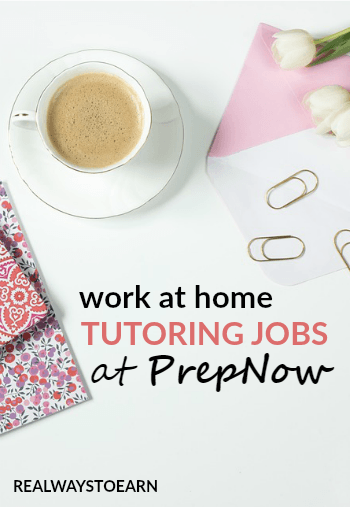 Work at Home Tutoring For PrepNow – Earn $15+ Hourly! Published July 30, 2013 By Anna T. This post may contain affiliate links. Regardless, I only recommend sites I've researched and/or used and trust. PrepNow Tutoring is a company that hires tutors to work part-time from home tutoring students across several different subjects as well as SAT and ACT test prep. The online tutoring jobs here are all for K-12 students. The company was created in 2007 by the founders of StudyPoint, another tutoring company based out of Boston that focuses on private, in-home tutoring. This job appears to be open to people in the United States only. Who is qualified to become a PrepNow tutor? The qualifications on the website state that you need at least two years of teaching or tutoring experience as well as a composite 28 on the ACT or a 650 on the SAT Math and SAT Verbal/CR. You also need a minimum of a bachelor's degree from an accredited college or university. How much does PrepNow pay? According to Glassdoor, PrepNow pays between $15 and $19 hourly for most tutoring positions. The SAT tutors may earn closer to the $19 hourly mark. Apparently regular pay raises are common here. It's worth noting that many reviewers said you are not compensated for the time you spend communicating with parents of the students you tutor. And sometimes it is necessary to field calls and emails from them in regard to their child's progress throughout the day. You are not paid for any of this — just your time tutoring. It is pretty flexible. Your hours are part-time and you need to be available at least 8 to 10 hours per week. You also must be able to do weeknights and weekends. During the application, you get to tell them what hours you would usually be available. PrepNow will pair you with students long-term, so this is different than many other online tutoring opportunities because you'll get to know your students over time. If you are familiar with online tutoring, you know that many companies don't pair you up with specific students — you just log in and tutor students randomly. As mentioned above, the tutoring is K-12 and covers all sorts of different subjects including test prep for the SAT and ACT. It does appear that they try to match you to your academic strengths. On the application, you let them know how confident you are to tutor in different subjects. Tutoring sessions last from one and a half to two hours. As mentioned above, many of the tutors currently working for this company are not happy that they aren't compensated for their time communicating with parents of the students they tutor. That said, most of the reviews I saw on Glassdoor are very positive. The company is supposedly very communicative, easy to work for, and they enjoy the work — it's very rewarding. Almost every single reviewer stated that the non-pay for tutoring time was the biggest drawback to their work for PrepNow. If PrepNow sounds like it would be a fit for you, you can go here to get started.